Koalas (Phascolarctos cinereus) are currently threatened by a highly infectious disease known as Chlamydia pecorum. In response to the growing prevalence of this disease in koala populations, researchers are treating affected koala bears with antibiotics According to BBC news, about half the koala population across Australia are infected with Chlamydia. In koalas, the effects of chlamydia consist of blindness, infertility, and an infection known as “dirty tail” which is an incredibly painful infection of the urinary tract and can ultimately result in death. Click here to read more about the koala epidemic. Despite antibiotic treatment, the koalas are still not surviving. Researchers at UC Davis suspect that the antibiotic treatment somehow interferes with the microbes in koalas’ guts and their ability to break down tannins, which comes from the Eucalyptus plant they feed on. The sudden inability for these bacteria to metabolize tannins leads to the koalas not being able to successfully consume and digest the eucalyptus leaves. In this research class, our goal is to identify and characterize the bacteria that flourish in the koalas’ gut microbiome and determine their susceptibility to antibiotics. 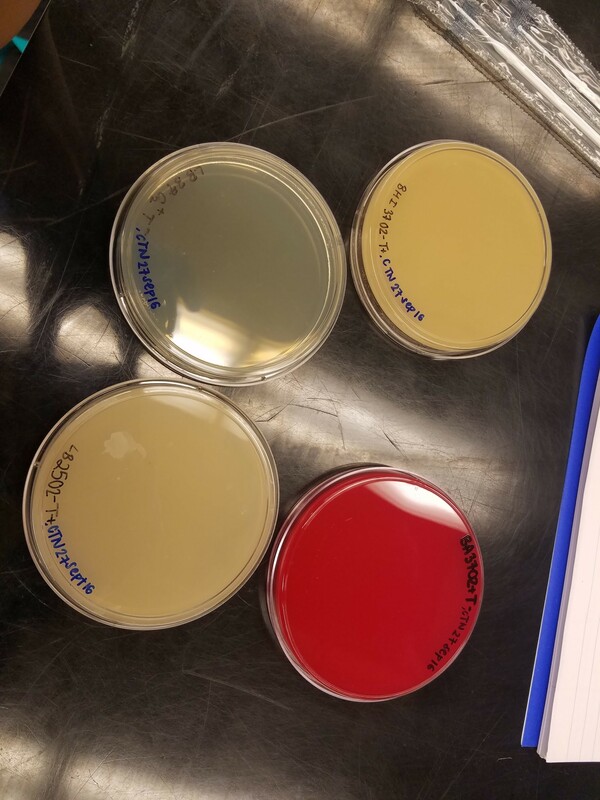 Our goal for the first week was to grow bacteria on various medias in petri dishes. The medias that we used are BA (Blood Agar), BHI (Brain Heart Infusion), and LB (Luria Broth). The growth conditions that we controlled are temperature (25॰C or 37॰C), oxygen (with or without), and Tannin (with or without.) Each of us obtained poop sample tubes from either koalas Austin, Zachary, or Cynthia, and mixed them with nanopure water. This initial task turned out to be challenging because of the chunkiness of the poop. It required extra time to well mixed the poop and water by vortex mixer. Once a brown slurry was achieved, the sample was centrifuged for a minute in order to obtain a supernatant containing bacteria. Each of us pipetted 100lof supernatant onto 4 plates that each contained a different media and different conditions. Then used an inoculating loop to gently spread the supernatant around the plate. The instructors will incubate all plates under the assigned conditions. We will have to wait until next week for further bacterial growth results. We also expect to learn about labeling conventions next week. This research class consists of all transfer students who have various backgrounds in lab techniques. In this first week, everyone seemed to have done a good job in terms of communicating and helping each other out. What we all seem to look forward to in this class is learning and refining lab techniques while being able to participate in a genuine research experiment. After this 10 week research class comes to an end, we hope to be able to apply the skills and the knowledge that we learn from this course in future biology lab work.